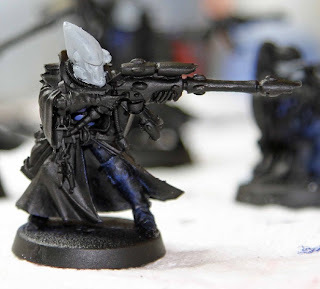 Eldar, the very thought of doing an Eldar army fills me with dread. All the different colours, all the patterns. the requirement for a delicate touch (being colour-blind and a ham-fisted is not a good thing!). But that's exactly why I want to do them, no only are they one of the most beautiful armies with some of the best models but also because I know they'll be a challenge for me. I can paint power armour, I know that, I have an entire Dark angels force of probably 7000 points all painted. So with that in mind Eldar are my challenge. The Illic model was the first one in the codex that caught my eye and so was the first one i bought, there is also something very iconic about the Avatar of Khaine, though the idea of painting such a detailed model worries me. However I didn't sign up to this to worry about my abilities, I signed up to improve and stretch my painting abilities. I've assembled a small 750-1000 point force with a couple of options for the HQ choice with the plan of using them as an Allied contingent. I'm going for a traditional paint scheme, Alaitoc, so its blues for the bodies and Yellow helms. To start I'm going to do the Pathfinders with a commitment of getting all 5 done before I move on to the Farseer and the Warlocks. Following the undercoat here are four of the models I was working with. I started by doing the stippling effect on the visible armour parts and painting and washing the chest panels with the Macragge blue. I also painted the helms and masks with the celestra grey to start the build up to yellow from black. Next I'll be applying the highlights to the chest panels, applying the first colour to the cloaks and painting the rifles grey so I can work up to a Wraithbone colour more easily. I'll also get the rest of the models assembled and undercoated. Any thoughts comments and even criticism are welcomed below the line. 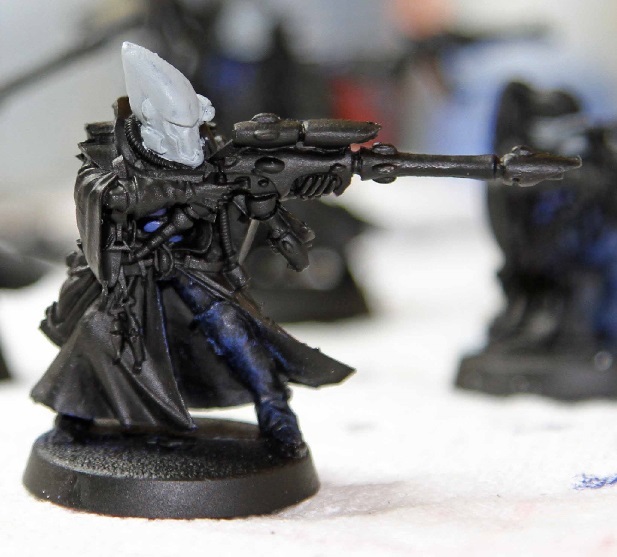 I'l be interested to see your Farseer and Warlocks, I have no clue what to do with them for Craftworld Alaitoc. Did you get all this from totalwargamer? 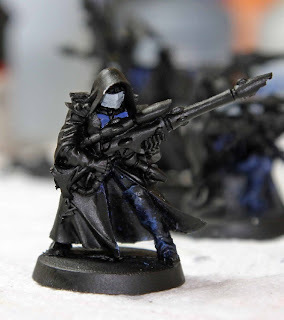 Are the ranges Finecast? Aspect warriors too? have they all turned out OK? Glen, most is from totalwargamer yes. everything except the wave serpent (bviously) is Finecast and its all been perfect. I have no aspect warriors at the moment, i'll probably get a box of guardians at some point. Ah good, I need to get some scorpions and my bad experience with finecast has made me nervous of getting them on-line rather than going to GW where they will check them for miss-casts for you. That Farseer does look good. I am eagerly awaiting updates.